Update: We seem to have hit a snag. Stay tuned for further developments. 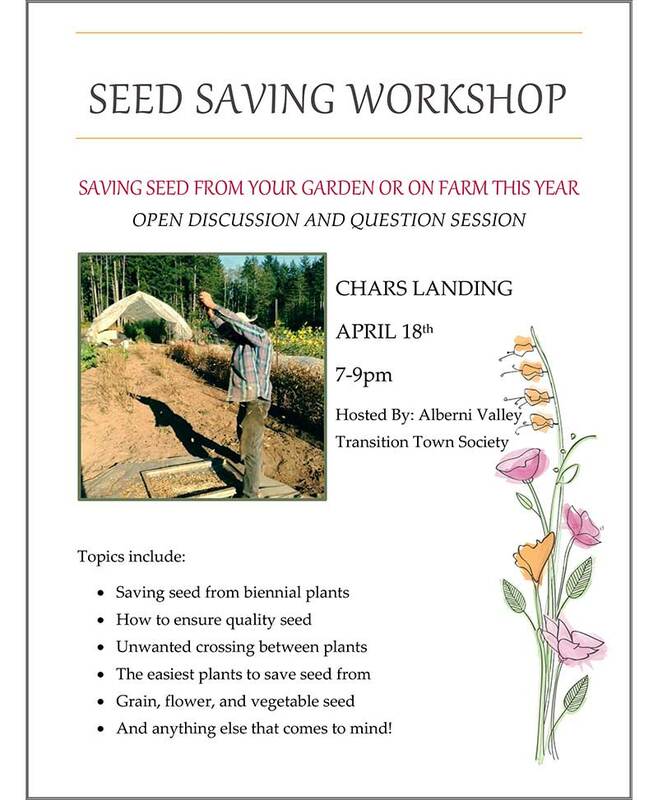 Meg has organized an interactive workshop on saving seeds and will tap into a reserve of knowledge already extant in the Valley with experienced seed-savers coming together to share the wealth of experience gathered over the years. Saving seeds is a frontline activity in the quest for food security and community resilience, a sign that the people involved are aware of the risks of long and sometimes overly complex supply lines. Saving seeds also puts us in touch with seasonal cycles of regeneration and tends to produce seeds adapted to local climate and soil conditions, hence optimized for local production. The workshop is open to the public and we welcome those wishing to learn a little more before getting started, as well as those more experienced planters wishing to extend their knowledge and possibly make connections with other savers with an eye to ongoing exchanges of lore and seeds. Alberni Valley Transition Town Society will be holding its monthly meeting in the hour prior to the workshop, and members of the public are encouraged to sit in, have something to sip and to learn more about how we go about building community resilience. The meeting will start at 6:00, Wednesday, April 18th, 2018, followed immediately by the presentation and round table/walkabout.